Watch TV anywhere you have a computer with eVGA's inDTube USB tuner. This portable TV tuner plugs into a USB 2.0 port and provides subscription fee free HDTV. The hybrid tuner can handle both ATSC and NTSC transmissions. There is also an AV in adapter so you can play or record from your VCR, camcorder or a DVD player. The included software had DVR functionality that lets you record to your computer's hard drive. You also get an electronic program guide and scheduled recording so you don't have to be there to record your favorite program. Even when you are on the road you can always catch your favorite show. Enjoy HD/SD TV on Your Computer The eVGA inDTube turns your computer into a true media center that receives worldwide analog TV and digital ATSC (up to 1080i/720p), complementing your digital multimedia experience. 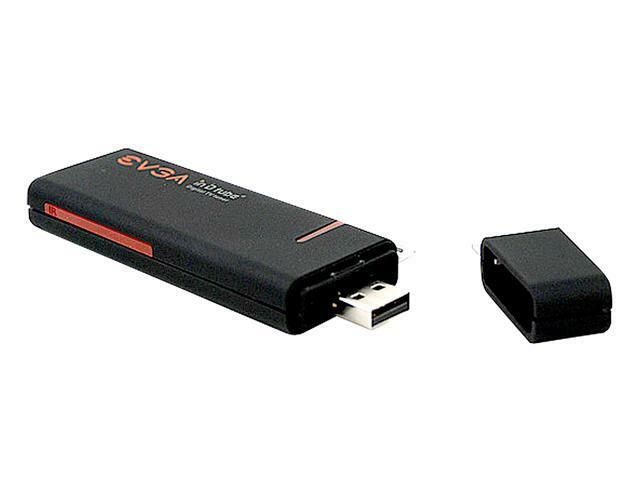 Portable Design The sleek, compact eVGA inDTube is fully powered via USB without the need for a power cord or a bulky power adapter for the ultimate portability. Time Shifting Function With the Time Shifting feature, pause or rewind shows, or skip scenes when watching live TV. Easy Operation with Remote Control A multi-function remote control is provided so you can access every feature simply at the press of a button. Pros: I use this unit for a very limited purpose - to view feed from my set top at work using channel 3/4 or composite video. The hardware is very good and drivers are good too. I have not used their application but instead I use VLC. My main concern was stability of the drivers and they are very solid. Unit comes with composite and S-Video input and picture quality is top notch. I installed latest drivers from chipset manufacturer and CPU utilization went down. eMPIA is original chipset maker in this tuner. Unit comes nicely equipped with antenna, remote and nice case. Also USB cable is very nice since it is self expanding and easy to take on the trips. Cons: I wish original software would be less bloated and was updated more often. Drivers are dated 2006 and chipset maker had drivers that are dated 09 2009. But original drivers do work well although use a little more CPU. I also wish that it would support clear QAM and I could capture raw transport with it, but this just wishful thinking. Other Thoughts: If you want to capture video from VCR or just watch some TV on your PC this device fits the bill perfectly. The system requirements are very modest for TV viewing - my laptop is Dell D600 with pentium M1.6Ghz and is over 5 years old. Pros: took it out of the box, plugged in the antenna, and then plugged it right into the front of my computer. Windows 7 then auto downloads the latest driver, i start up media center, and im watching EVER local NY channel, im surfing 50 channels FREE right now. Cons: um, yeah blister pack evga? get with the times, go cardboard plain packaging already. the plastic pack just needs to go. Other Thoughts: absolutely amazing with this product, and on top of that worked right of the box, no alterations needed. Pros: Bought this thing on sale. Christened it into a new install of Windows 7 Home Premium 64bit. Drivers were found automatically by Win7. Started Media Center, did the couple of click setup and bam, HDTV OTA. The antenna provided was surprisingly better than some of the small HDTV antennas sold in aftermarket. Was surprised to see this little USB device perform so well. Loads while playing this in media center was < 5%. I did not install any of EVGA software that came with the bundle. The remote control so far does not work in Media Center (at least I haven't figured it out). Gets mighty hot when in use for a while. Cheesy USB extension cable broke apart while the package was being opened. Too much plastic molding of packaging. Bad for environment to make, increases oil consumption, bad for landfills. Package could have been 1/2 the size if EVGA wanted. Cons: Can not pick up any local channels and I live in an area with lots of stations locally. I tried it with a cable feed, and it sees that OK, so it's just a very weak tuner. Check elsewhere. Other Thoughts: Too late to return. The antennae strength can vary greatly depending on your location and location of the antennae. I would suggest trying the antennae at different heights and different locations. Pros: I picked this up today from a local store that mislabeled it, and still sold it to me for about 12 dollars, what a deal. Anyway, installed quickly and easily, works just fine with Windows XP SP3. I like that it has an option to be "Always on Top". Cons: It is very slow in response time. The remote is pretty weak. It takes forever to respond pretty often, but since I'm using the card in my desktop, this isnt so much of an issue. I usually just use the on screen controls. Other Thoughts: When plugged directly into the wall, not to a cable box or satelite setup, you get the analog cable signal, which is alot lower quality than most people are used to now. Thats why so many reviews complain about quality. This is the same with MOST TV Tuner cards/adapters, keep that in mind. Pros: It picks up terrestrial hdtv/sdtv signals. Cons: Does not work with software supplied. Gets very hot where it connects to the antenna or extensions. I have yet to get it to work with cable tv. The update for the software on eVGA's forum does not work and has not worked for months I am told. Other Thoughts: I have a sony vaio with full hd, the picture is not 1080i from my point of view with this tv tuner.. I hope we get some firmware and software updates very soon so I can update this review. When you insert the TV tuner the software says there is nothing in there.. Tried multiple installs no luck.